On the third and last day we took the first water taxi we could get, across to the South West shore, to San Pedro La Laguna. This is known as the “party” town on the lake and has a lot more life to it. It lies at the base of one of the volcanos, from which it takes it’s name. There are lovely restaurants, open air bars, coffee shops, smoothie bars, markets with beautiful locally handmade goods, great places to stay with breathtaking lake views and a multitude of Spanish schools for those who want to learn the language from the locals. After a good coffee, a bite to eat and a brief chat with some cruiser friends also visiting from the Rio, we returned to Panajachel, also known as the “tourist town”, to continue the bike tour. After collecting the bike from the pink hotel, we got back on the road at around 12h30, to return to Antigua via Patzún, Patzicía (Chimaltenango) and Pastores. We descended the beautiful highlands, waded through a few more streams and rivers, zipped along a highway where we had to pull over because the rain was so heavy it felt like we were being pelted with nails, and then finally into the peaceful town of Pastores. 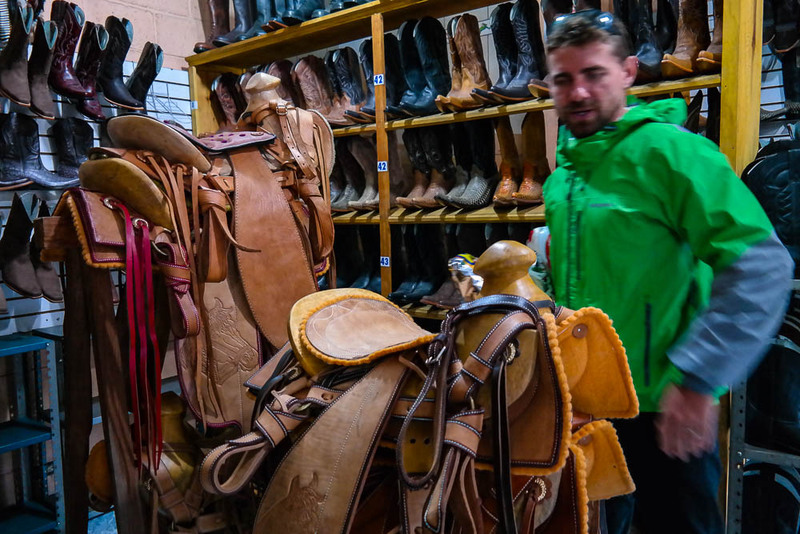 Pastores is known for handmade leather boots and I promise you, you will not be disappointed. The main street is lined with many small shops, filled with all the colours and styles you could imagine. Every boot is hand made and you can watch the cobbler at work. They range from about Q300 – Q400 (USD 38-50) for a pair and worth every penny. The craftsmanship is superb and I am almost certain they will last you a lifetime. I still want to go back and get a pair for myself. When we return to Central America, after our circumnavigation is complete, I will go back and buy a few pairs, for sure. Ten minutes drive from Pastores we were back in Antigua and we were pretty bummed when we rode back into town and realised our bike adventure was over. It is one of the best trips we have ever done and well worth the freezing altitudes, icy rain and the painfully bruised behinds. If you are ever in the area go down to Moto Tours and rent yourself a bike or take a guided tour with one of their experienced local guides. The rental for 3 days was $200 and the fuel for approx 500km was a total of $20. So worth it!